MANILA, Philippines - The official results, list of passers, top examinees and other important announcements for August 2017 Civil Service Exam - Pen and Paper Test (CSE-PPT) both for professional and subprofessional levels are released by the Civil Service Commission (CSC) within forty one (41) days after the eligibility examinations. 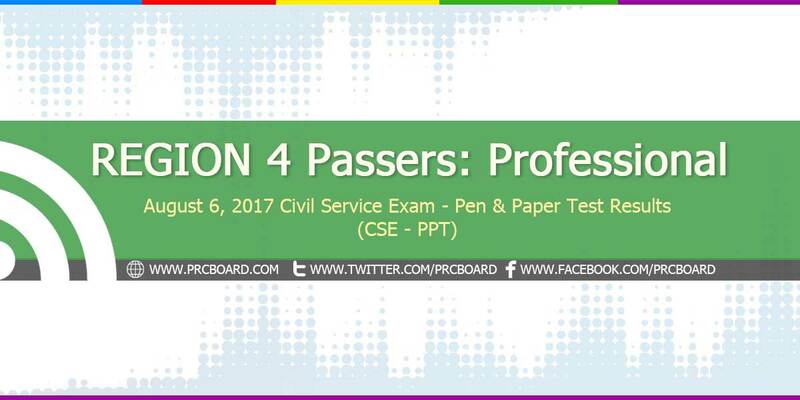 Below is the complete list of passers for August 2017 CSE-PPT Professional Level in Region 4A and 4B (MIMAROPA & CALABARZON). ZURBITO, SUNSHINE MARIE A CSE-PPT (Professional and SubProfessional) are eligibility exams conducted by CSC twice a year to cater the growing number of individuals who wish to serve in Philippine government. Excited for the release of list of passers for the csc exam held on August 2017.
congrats po sa lahat ng pumasa. Final npo b yung result ng exam? congrats sa lahat ng pumasa. Yes. :) Thank you Lord. sino pede kainuman dyan.. nakakaiyak eh (T-T). Ã read as ñ ba? Finally! I passed! Sa mga di nakapasa papasa din kayo. Ako nga 5th try bago nakapasa. Haha Nakakabobo ang feeling nong di ako makapasa pasa. Ive done my best pero wala pa din.Umiyak nga ako sa simbahan nong di ako nakapasa. HAHA Di na sana ako magtetake ulit pero my family pushed me na try parin. Buti na lang nakinig ako. Kaya naman, In God's Time papasa din kayo. Tiwala lang. :) God bless us all. Thats all. I Thank You! NAKAKABA NAMAN MAG TAKE NITO..